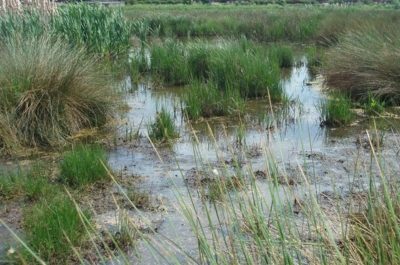 A marsh is an ecosystem of more or less continuously waterlogged soil. Marsh is found on level ground in the vicinity of rivers, streams or waterlogged places where the water table is close to ground level for most of the year. Marsh tends to be species rich in terms of wetland plants and does not have a surface accumulation of peat. Large areas of marshland have been drained on farmland across the country. Marshland can sometimes be restored by blocking drains. Marshes exist primarily because of their proximity to the water table and any attempt to lower the water table has the potential to damage or even destroy a marsh. Willow scrub can dominate marshland and the habitat will slowly transition to wet woodland if left unchecked. Selective grazing in late summer can help to control the encroachment of willows. Marshland is an important habitat for a wide variety of plant species including several orchids. Marshland is now a relatively rare habitat in the Bride valley and many plant species associated with the habitat such as Meadow Thistle, Common Valerian and Marsh Cinquefoil are now very restricted in their distribution within the catchment. The Small Heath butterfly can often be found on the edge of marshland and it is an important habitat for frogs, newts and several bird species such as Snipe, Meadow Pipit, Willow Warbler and Reed Bunting. Marshland has the capacity to store large volumes of water and widespread drainage in recent decades has undoubtedly contributed to increased flooding.